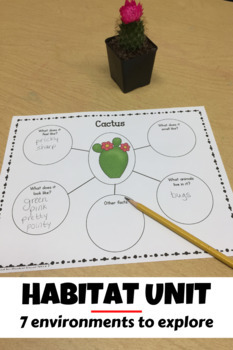 This unit includes a variety of organizers and recording sheets to help your students explore and learn about the habitats. 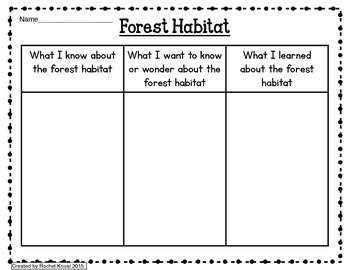 Use the pages to record your students' sense of wonder, interesting facts, and information about each habitat you study. Staple the pages together to create a journal for each individual habitat or bind them altogether. The riddles and habitat sorting mats are my students favorite activities! 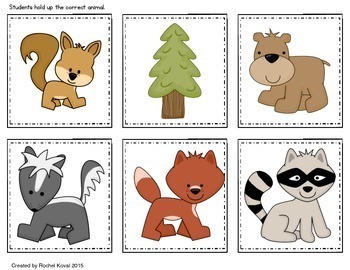 Cut out and laminate the riddle and animal picture cards. Glue the animal cards to popsicle sticks for kids to hold up to answer each riddle. 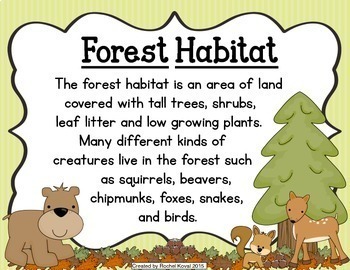 Print out the habitat and animal cards for kids to sort onto the correct mat! A booklist of resources is provided too! Please go to your My Purchases page (you may need to login). Beside each purchase, you'll see a Provide Feedback button. Simply click it and you will be taken to a page where you can give a quick rating and leave a short comment for the product. Each time you leave feedback, TPT gives you feedback credits that you can use to lower the cost of your future purchases. Your feedback is greatly appreciated and helps me create products that benefit your class. Be sure to "Follow me" for store updates and sale information! Look for the green star under my store name and click it. Thanks!